WASHINGTON (AP) — Federal investigators are blaming a lack of required testing for sleep apnea for recent train accidents in New York and New Jersey that killed one person and injured more than 200. The National Transportation Safety Board released a report Tuesday on accidents at Hoboken in September 2016 and in Brooklyn in January 2017. Both accidents caused more than 100 injuries, and the Hoboken crash killed a woman standing on the platform. In both crashes the train’s engineers were found to have undiagnosed sleep apnea and couldn’t remember their trains accelerating before the crashes. 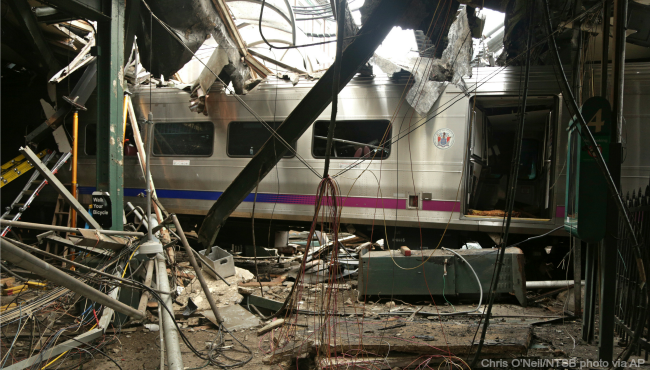 The NTSB blamed New Jersey Transit and the Long Island Rail Road for not having required testing in place. It also blamed the Federal Railroad Administration for not making sleep apnea testing mandatory. Last year the Railroad Administration abandoned plans to require the testing as part of President Donald Trump’s effort to reduce federal regulations.